The SkyActiv-G 1.5-liter engine (P5-VPS, P5-VP (RS)) is a smaller version of the 2.0-litre engine in the SkyActiv series. This smaller displacement unit was first offered in the Mzzda2 and Mazda3, and then in the MX-5 models. The P5-VP (RS) engine is for Mazda MX-5 ND model. Mazda has tried not to lose all the advantages of the new engine and at the same time to achieve high performance in fuel economy. The SkyActiv 1.5 engine has a small, lightweight aluminum cylinder block with reduced bores and stroke to achieve a capacity of 1496 cc. There is a more common cast iron crankshaft inside, but all MX-5 engines have a more sturdy steel crankshaft to hold higher RPMs (redline is 7500 rpm). An aluminum cylinder head of the 1.5 engine has the same SkyActiv design as the 2.0 and 2.5 engines: two overhead chain-driven camshafts, four valves per cylinder via roller rocker arms, Dual Sequential Valve Timing system (or Dual S-VT). The high-presser fuel pump has attached the head and driven by exhaust camshaft. The 1.5 SkyActiv-G engine also has direct fuel injection system. There are individual electronically controlled six-hole injectors inject fuel directly into the cylinders. The engine has unique shape intake ports for generating a vortex effect within the combustion chamber. This effect provides a better and uniform air-fuel mixture, more efficient combustion and operation. The exhaust gases exit through a 4-2-1 header with long runners. All engine of SkyActiv series feature by the 4-2-1 exhaust system. The modern Mazda’s SkyActiv technology significantly improved dynamic performance and fuel efficiency of the 1.5 SkyActiv-G over the previous MZR 1.5-liter engine. 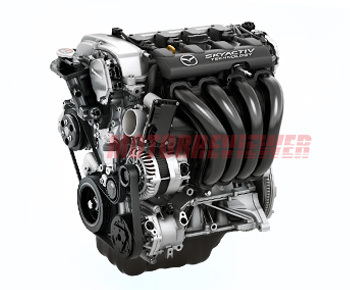 The 1.5 SkyActiv-G engines are small, reliable engine by the modern standards. The mileage of 100,000 miles is easy going. There are a few things which can happen to this engine. Spark plugs do not run for long on this engine. There were also breakages of ignition coils which are quite expensive. These breakages often occur due to low-quality fuel. Another common report for SkyActiv engines is about rising oil level. That caused by penetration of gasoline into the oil. But official dealers and Mazda service often refer to incorrect exploitation. P5-VP (RS) - 131 hp (96 kW) / 7,000 rpm, 111 ft lb (150 Nm) / 4,800 rpm, - special version for Mazda MX-5 model. This engine has the steel crankshaft as was mentioned early, lightweight rotating parts and different cam timing. With these modifications, the engine redline raised to 7500 rpm. The intake system is different also. It includes a variable length intake manifold to increase power and torque by reducing the length at high engine speeds.